Falcon Facts /Hawks Aloft Inc.
One of our annual fundraisers is a photo shoot and lecture of some of our educational ambassadors and the wild cousins they represent. We thank Doug Brown, Keith Bauer and Greg Basco for organizing this as a part of one of their multi-day photography workshops. You might also note that many of the images that you see on our website and Facebook pages, are donated to us by these superb photographers. This year, we thought it would be fun to take all four species of falcon that might be found in this region at some time of the year to the class. Male American Kestrel. Image by David Powell. 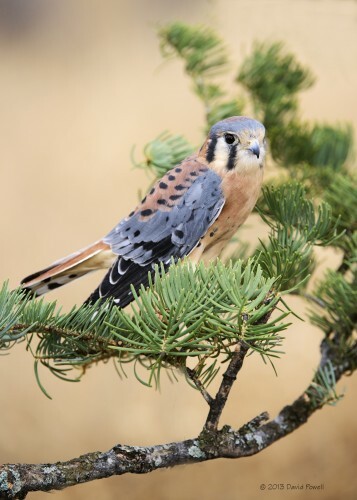 The American Kestrel, represented here by our avian ambassador, Clark Kent, is the smallest falcon in North America. In New Mexico, it is present year-round. One of the fascinating facts about this particular species is that males and females have markedly different plumage. Clark Kent was named by one of our youngest volunteers, Lindsey Porter. When given the task, she was told the name must be educational. “Clark Kent” was named as the alter ego of Superman because Lindsey learned to tell the difference in the sexes when told that “each morning when the boys get up they don their blue Superman cape”, just like the action figure. Females are brown and black barred throughout, except for a circle of blue-gray on their heads. Meet our newest Educational Ambassador, Merlie, a female Merlin. Image by Keith Bauer. Merlins are somewhat larger and definitely heftier than the diminutive kestrels. In New Mexico, they are present only during the winter months. They nest in the boreal forest of the northern U.S. and Canada. “Merlie Falconbird” was named by Will Fetz, six-year-old son of Trevor Fetz, our lead avian biologist. Will was adamant that Merlie have both a first and last name. At first glance, Merlins look like a weird female kestrel with the vertically streaked breast and pale malar stripes. But upon closer inspection, Merlins have banded tails and are stockier than kestrels. They also have different plumages between males and females but the differences are less obvious. You can tell that Merlie is a juvenile by the bluish membranes around her eyes and nares. Sunny, the Prairie Falcon. Image by Keith Bauer. 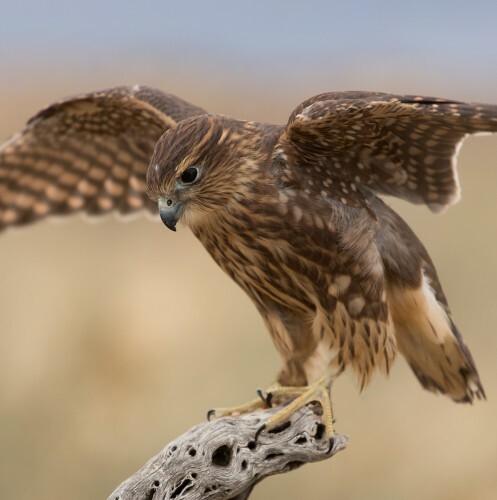 Prairie Falcons are the large falcon of the arid West. 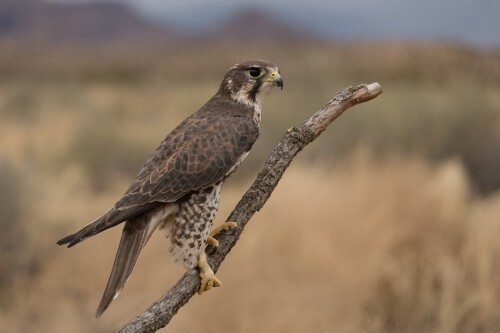 They are found in drier habitats than their similar sized cousin the Peregrine Falcon, nesting on rock faces and preying primarily on other birds captured after a low coursing flight over uneven terrain. The Prairie Falcon is brown on the back and whitish and brown on the breast. “Sunny” was named by Gena Esposito, our education and outreach coordinator in 2013, when he was admitted with his wingtip shorn away. He was found on a trail by hikers, far from any roads, so we have no idea how he was injured. He was named Sunny after Butch Cassidy, the Sundance Kid, for his plucky, survival instincts and the dark malar stripe that reminded her of the moustache of the Sundance Kid. In this image, you can see that Sunny is undergoing a molt. The darker feathers are the new ones that are growing in, while the pale feathers are the worn ones that are being replaced. Isis, the Peregrine Falcon. Image by Keith Bauer. Isis represents the goddess of the same name, the most powerful of all. The Peregrine Falcon is the largest falcon in this area, eclipsed only by the Gyrfalcon of the Arctic Regions. 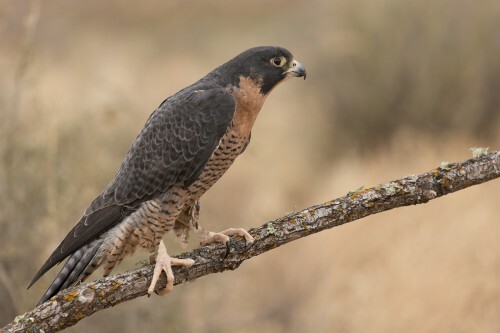 In New Mexico, peregrines nest on tall cliffs, usually near water. They have been documented by National Geographic diving on prey at speeds of up to 248 MPH. This makes them the fastest flying birds in the world, in a stoop. Their prey is generally other birds that they capture in the air. Isis is an adult peregrine, evidenced by her full black hood. All falcons have dark eyes. Thanks for this piece. Fascinating and I always learn at least two or three new things reading your stuff. Have loved birds of prey for many years. Always look forward to reading new posts. Hopefully we will visit someday. Keep up the great work. Thanks Scott! We appreciate the comments, and will work harder to produce more posts like this one!